Thin-crust artisan pizza enjoyed in-house or for take-home. : Life of Pie’s keys to success lie with its crispy pizza crusts and use of quality ingredients, which range from local low-gluten Shepherds Grain flour to homemade mozzarella, marinara sauce and fennel sausage. 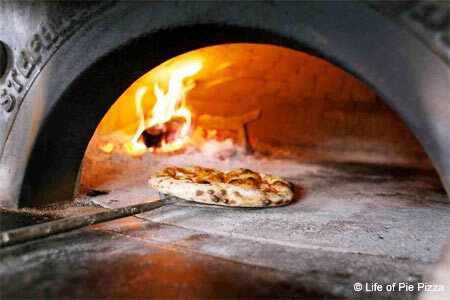 Lightly charred on the outside and chewy and moist inside, crusts are the product of a gigantic, handmade wood-fired pizza oven imported from Naples with bonded bricks and mortar made from the volcanic ash of Mount Vesuvius. Although the pizza list is limited, any of the imaginative combinations are worth ordering, and size-wise, all are on the “large” side of personal. Purists may like the margherita (just $5 per slice until 6 p.m.) or the fennel sausage with Mama Lil's hot peppers. More daring eaters will enjoy the bacon-goat cheese combo with roasted leeks or the seasonal mushrooms with shaved Pecorino and truffle oil that manages to be rich without being heavy. Don't miss some of the best arancini (fried rice balls stuffed with cheese) in town, or the kale and arugula salad dressed with a honey-lemon vinaigrette and a sprinkling of toasted breadcrumbs. Plump meatballs are also tasty. There's a nice selection of wines for $6 per glass.